Sea Walk is the most unique and magnanimous experience that you can have in the Andaman Islands. It’s an activity that combines the very best of the scuba diving experience without having to dive and swim constantly. Imagine getting to walk on the ocean bottom, as if you are walking on the land, without any need to balance or continuous swimming. You can enjoy a satisfying walk on the ocean bottom, surrounded with live corals up-close, and enjoy the underwater excellence. Surrounded by hordes of colorful fishes and creatures, you can indulge in the beautiful underwater biodiversity which will make everlasting memories. To make the experience evergreen, you will also get a video footage of your whole Sea Walk Venture so you can keep it safe as a wonderful memory and show it to your friends & family on Facebook and in person. Andaman offers a wide variety of water sports but sea walk is something that can only be done under just the perfect setup. Therefore there are only 2 places where you'd be able to sea-walk in Andaman. Havelock, Elephant Beach to be specific is a haven for water sports in all of Andaman and probably has the most diverse collection of activities at one place in India. It's no surprise that the sea walk in the isles started from here and it is still the best place to experience it. The waters surrounding the beach is famous for wide strips of underwater volcanic formation that houses one of the most richest coral population, accessible to tourists in the Indian ocean. 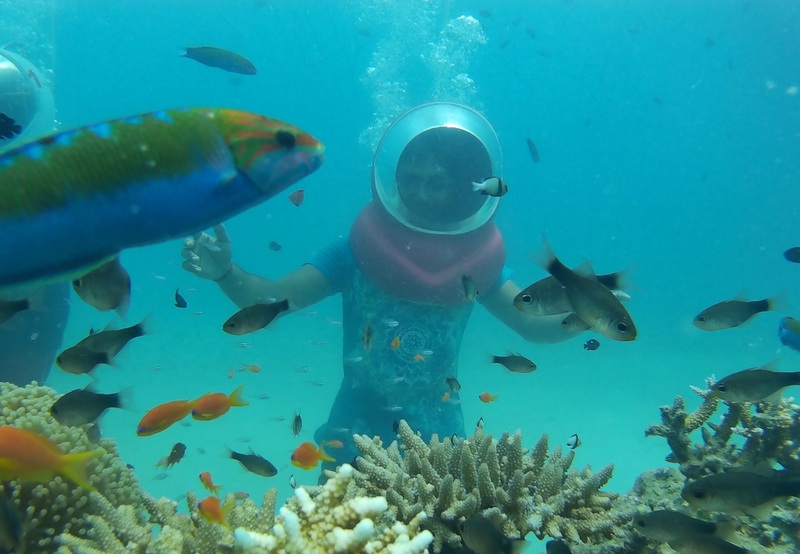 This dense coral forests house some of the most colorful and rare fishes that Andaman has to offer. Once you are inside the water the weight of your body fades away and yo are suddenly surrounded by hoards of fishes and sea creatures that present a beautiful scene around you. To make it even more amusing, the vendors will provide you with bait to feed the fish, so you can feel them around you without having to walk. Overall, a great experience that you'll never forget. 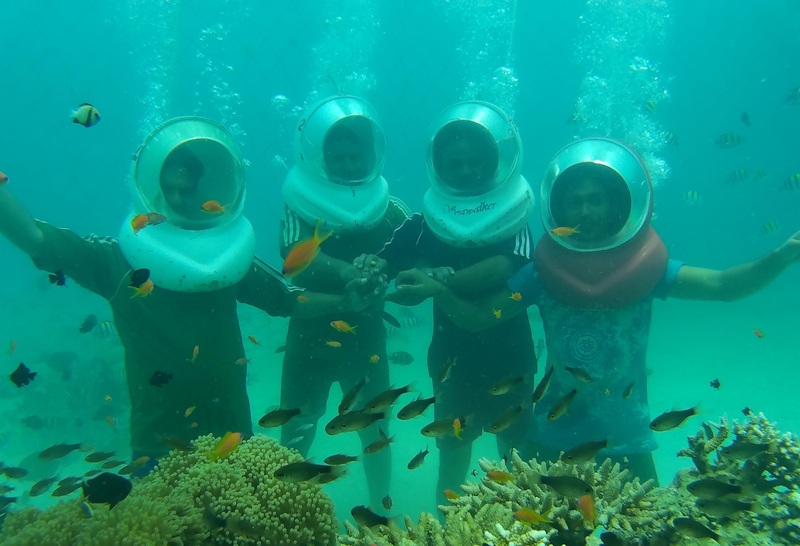 North Bay is the second best place to experience sea walk in Andaman, and is constantly loved by tourists for all the underwater splendor it has to offer. The corals here are divided into small yet dense parts which are home to dozens of magnanimous fish species and lobsters that are waiting to be gazed at in awe and wonder. The island has to be reached only by a boat and there are no hotels or other place to stay in the island, so you'll have to return back to Port Blair within the same day. A great place to visit for sea walk if you'd like a unique experience and don't mind spending some time there. You will be taken to through the 5-10 min training tutorial where you will learn some tips on walking correctly inside the water and hand signs for communication during your Sea Walk. Next, a helmet type breather with transparent front will be fixed on your head comfortably and will be connected with the rest of the apparatus for normal underwater breathing. After the setup you will be taken to the Walking-Spot and slowly leveraged inside the water with wide netted boundaries for maximum safety. A team of Sea Walk guides will be there with you every step of the way to make sure your experience is safe, hassle-free, and completely out of the world. The average cost of doing sea walk is around 4500/- per person, while Elephant Beach is the best place to experience it, the costs can be a little bit high due to demand. Check the pricing table below to have a better idea about the cost. Which island is the best for Sea Walk? Elephant beach, located at the Havelock Island is the best place for sea walk in Andaman and Nicobar Islands. The key reason is the location of walk is really great and filled with lots of fishes and because most people go to Havelock during their vacation and it helps you save more money and time by doing your activities there. A very close runner-up would be North Bay. What is the best time for this Activity? 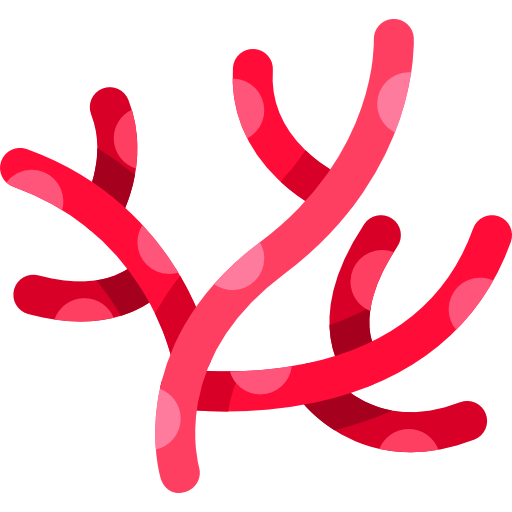 The best time for a deep sea walk is from between May and June as the weather is really favorable, the corals are blooming and the visibility of water is the highest in between these months. The best time would be in between 9 A.M to 4:30 P.M. , so make sure you have the day planned accordingly. Is there an age limit for Sea Walk? Anyone above the age of 9 and under 60 can experience sea walk without any restrictions. Senior citizens above the age of 60. People under heavy medication or in need of care. People with have psychological conditions which cause distortion or panic underwater. How deep will we go during our Walk? The usual depth of sea walking is anywhere from 7-10 meters, depending on the location. The apparatus is made to withstand the pressure generated at this depth, so your experience will stay hassle-free and dreamy. Is it safe? Does it get uncomfortable due to pressure? Yes, It's perfectly safe because the apparatus is made to withstand high amounts of pressure and can take heavy load for long periods of time. No, It doesn't get uncomfortable, thanks to the apparatus. It is made to fortify the chest and face of the walker that keeps the pressure away and therefore you can breathe easily without any breath shortness, which is really comfortable. Is it necessary to know swimming for this Water Sport? No, It is not necessary to know how to swim in order to go for sea walk because you won't be swimming in the water but walking on the surface of the sea.